“There will be a chicken on my headstone, I’m so well-known for it,” says chef Jonathan Waxman of Barbuto in Manhattan. 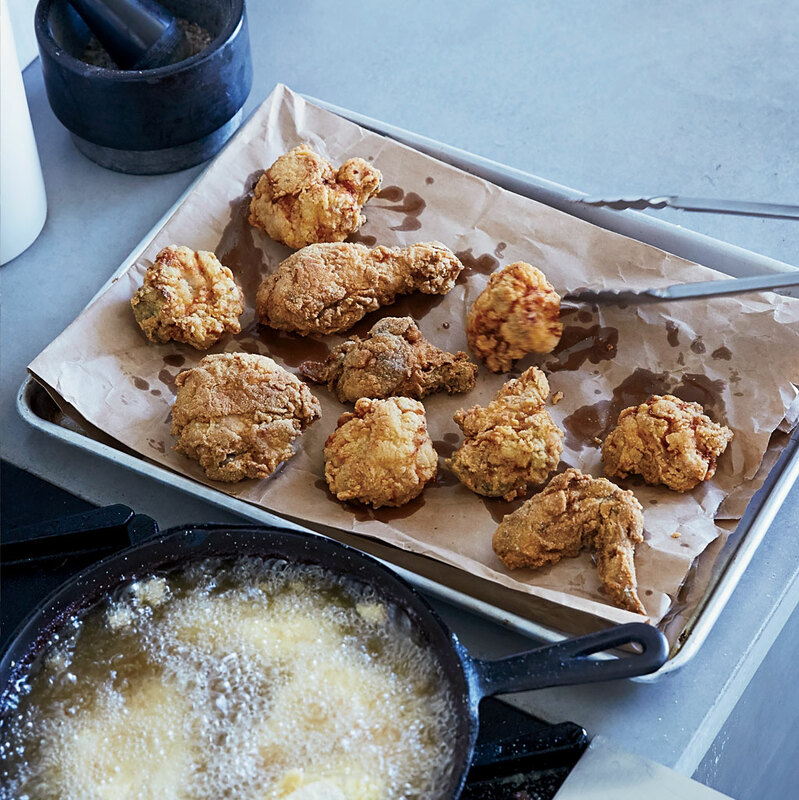 For his signature fried chicken, he dips pieces in buttermilk, then dredges them in fine cornmeal to achieve a supercrunchy crust. Slideshow: More Chicken Recipes Recipe from Food & Wine Chefs' Easy Weeknight Dinners. Preheat the oven to 325°. In a small bowl, combine the crushed red pepper and ginger with 1/2 teaspoon each of salt and black pepper. In a large bowl, coat the chicken pieces with the dry rub. In a 12-inch cast-iron skillet, heat the oil to 350°. Place 1 cup of the flour and the buttermilk in 2 separate medium bowls. In a large bowl, whisk the remaining 1 cup of flour with the cornmeal and season with salt. Dredge the chicken pieces in the flour, shaking off the excess, then dip them in the buttermilk and dredge in the cornmeal mixture. Fry half of the chicken pieces, turning occasionally, until deep golden and cooked through, about 15 minutes. Transfer the fried chicken to a baking sheet and keep warm in the oven while you fry the rest. Drain on paper towels or butcher paper before serving.